Lipton® sides is delighted to join forces with Knorr®, the flavor experts- and now our name is changing to Knorr® sides. In addition to your family favorites, we'll offer an expanded range of flavors from across the country and around the world. Knorr® is committed to lowering sodium levels and has done this over time, while maintaining the delicious taste your family enjoys. 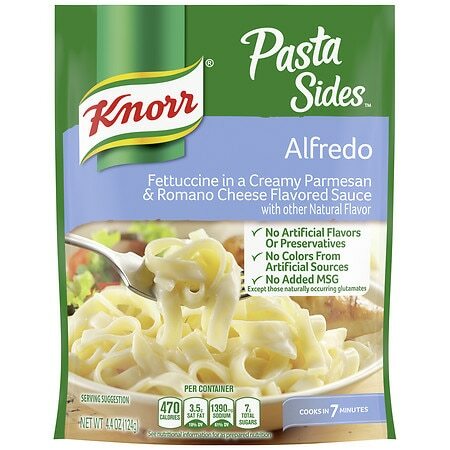 Sodium content has been lowered from 890mg in an earlier version of Knorr® Pasta Sides - Alfredo to 670mg per serving. Top-of-stove: In medium saucepan, bring 2 cups of water and 1 tbsp margarine (optional) to a boil. Stir in contents of package. Continue boiling 7 minutes or until pasta is tender, stirring occasionally. Let stand about 2 minutes. Stir and serve. Microwave: In 2-quart microwave-safe bowl, combine 2 cups of water, 1 tbsp of margarine (optional) and contents of package. Microwave uncovered at high about 10 minutes or until pasta is tender. Stir and serve.